The 2L team included Chynna Hibbets, Jordan Jennings, Olivia Pinkelton and Paul Sime, and the 3L team consisted of Jalyn Hewitt, Cailyn Butler, Jason Hernandez and Sabrina Castille, all members of the Black Law Students Association (BLSA). The competition was held in conjunction with the 2019 Midwest Black Law Student Association Regional Convention. 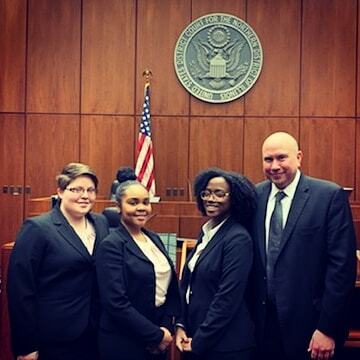 The Constance Baker Motley Mock Trial Competition, one of six regional competitions hosted by the National Black Law Student Association (NBLSA), is one of the largest and most respected law school mock trial competitions in the country and aims to develop legal advocate skills. Competitors learn to develop a case from its inception to conclusion in the form of a trial. The competition includes rounds that simulate a civil trial proceeding where each team offers opening statements, direct and cross examination of witnesses, and closing arguments. Participants can develop strong courtroom skills and argue issues that are at the forefront of debate in the legal profession. The UK Law students were coached by Daniel Whitley, a local practitioner, and Amanda Parker, an Assistant Commonwealth Attorney in Fayette County. Students and coaches spent many hours practicing during the three months leading to the competition. "We keep improving every year and everyone noted the growth of this year's teams. Most of the coaches and judges took their time to compliment UK Law students," said Whitley.